Two years ago I embarked on a very ambitious Christmas gift for my mom. 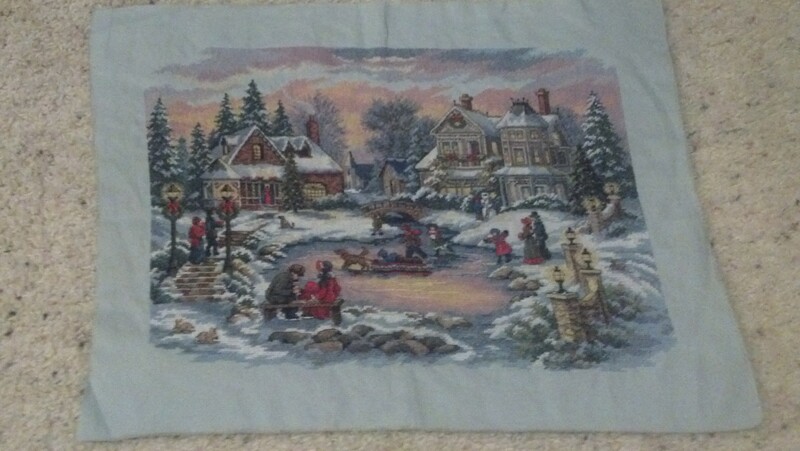 A beautiful cross stitched Christmas landscape designed by Thomas Kinkade. There aren’t any good shops in my local area to get cross stitch patterns and kits so I had a friend stop at Hobby Lobby in Auburn for me. She sent me a couple of patterns and I selected “A Treasured Time“. She told me the size and price and brought it to me. I greatly underestimated how large 12×16” is! I had never undertaken anything so big before, and greatly misjudged my ability to complete it in time. I didn’t start on the project until the family left my home Thanksgiving weekend. Needless to say, given the title of this blog post, I did not complete this masterpiece in 3 weeks. And Santa’s elves were too busy to lend me a hand. I took this project on every work trip, spending hours in hotel rooms each night working on it. I would stitch every evening while Stuart played video games. It came with me on long car rides. After two short, yet long, years I have finally completed this winter scene. I can’t even begin to tell you how relieved I am! It will probably be another year before I decide to tackle something so big again. I am used to doing ornament sized pieces that take me 2 days to complete. I will return to some quick fun pieces soon. Having my Christmas tree up puts me in the cross stitching spirit. This is beautiful!! I love to cross-stitch! I have never been brave enough to tackle a project this detailed! Great work! Thanks. I learned so much during this project, tackling things I didn’t even know were “a thing”! Using different colored threads in each strand, using more than 2 threads or only 1, doing half stitches instead of the full x. And as always, I have to turn to youtube for the French Knot tutorial – I can never seem to remember that one from project to project.